Contributed by (Wing Commander) Mike Quigley . 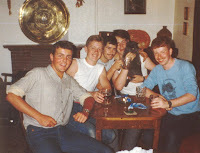 . .
UPDATE - Kev Hudson provided some background to these pictures here. 'R&I' was short for 'Resource and Initiative' training. The most initiative displayed was usually in having the best piss up holiday one could get away with! There were three R&I's over the apprenticeship period and I seem to remember that they became more 'interesting' the higher the number. So by the time you got to three, the class could decide on its own plan, so long as it involved some sort of adventurous activity. Here Class 1 are at R&I's 1 and 3. I can't remember what R&I 2 was all about. But 3 for Class 1 looked like surf canoeing, given the picture above. Class 3 did our 3 in St Ives, Cornwall. We pitched RAF 12 man tents in a commercial holiday camp and surfed our kayaks on the local beach. It was basically a good holiday at the expense of the RAF. Lots of clubs, girls and beer involved. Rich Gaze managed to dislocate his shoulder in a surfing mishap. He spend the rest of the 'training' with his arm in a sling and met his future wife on the campsite whilst hanging around. I remember our Flight Commander wryly commending my 'initiative' in booking such a comfortable site . . .